Sitting in my seat on the air conditioned bus on the way to Schlitterbahn a little past nine in the morning, I couldn't help but second guess my decision to be on this "extreme" press trip to Kansas City. Today we had crossed the river and gone from Kansas City, MO. to Kansas City, KS. with the sole intention of having an "extreme" day of fun. Now, as we shuffled past a winding line of people waiting to get into the park and sign up for their chance to ride the tallest water slide in the world Verruckt, it was all becoming a bit surreal. There was quite a crowd gathered along the entrance to the park and winding their way through to the gates. 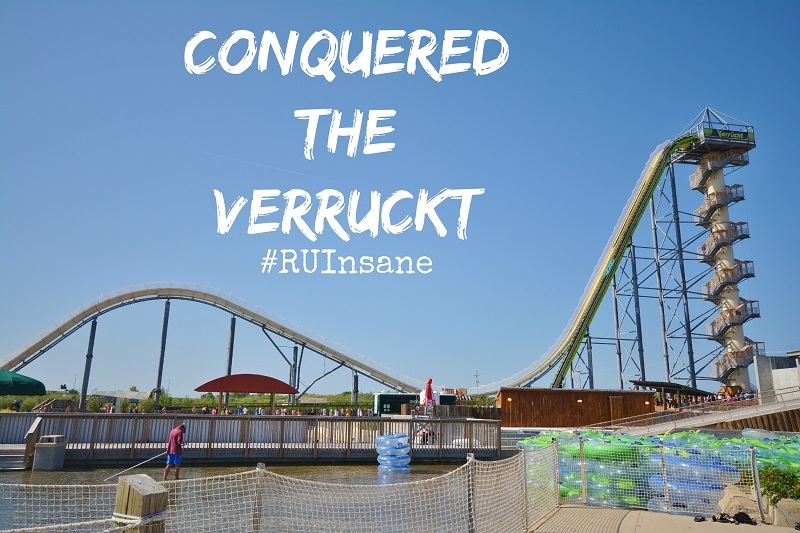 Most were here for the same reason we were, to experience the thrill of Verruckt, whose name literally means "insane" in German. As we walked passed the crowd with our guide Layne, we had an even better view of the rather intimidating Verruckt. Creator Jeff Henry has labeled Verruckt "a monster", and on that morning as I was being read my rights and asked to verbally agree to the fact that the ride could cause physical or mental damage, I could not have agreed more. It is one of those experiences that you don't know how you get yourself into, but you know you'll regret it if you don't just try it once. After verbally signing my life away and being weighed with my group for the first of two times, we headed up the 264 step hike to the top of the tower. As my feet took each step, all I could think about was death row and this is how people must feel taking their last steps. What I was feeling though, wasn't dread, it was exhilaration. The staff has strategically placed signs for you to view on your way to the top. One, alerts you to the fact that you are now higher than Niagara Falls. It is at this point that you are tempted to look down. Learn from my experience and know that you should probably avoid doing this if you are at all afraid of heights. Once at the top, our group was weighed yet again. Each three person raft must have a weight of between 400-550 pounds in it, and they check this thoroughly for safety. You must be seated in the raft from those of lightest weight in the front to heaviest in the back, so be prepared for some awkward conversation if you don't like to state your weight. All to soon, I found myself sitting in the back of the raft with a Velcro strap across my waste awaiting my fate. It is at this point that I began to question my sanity. Perhaps this is what they meant when they said the ride could cause mental damage? I thought for a split second about digging my claws into the platform like a cat and refusing to let go, but in the split second of that thinking, we were falling off the platform. When I say falling, I do indeed mean falling. There is no other way to explain the feeling you have when you first start down Verruckt. Free falling. Not sliding, not gliding, not tobogganing, just falling, and falling fast! 17 stories worth of free falling to be exact. Soon enough though, you reach a dip, and head back up a 55 foot hill. It is during this time that your brain has a second to catch up with your body and you try to figure out if you are still alive, but then you are careening back down a 5 story fall to the splash area at the end of the ride. There are no words for how riding Verruckt makes you feel. other than insane. It indeed lives up to its name's German translation, because you feel utterly insane for having just done it. The whole ride is over in less than 15 seconds, but feels much longer. During those split seconds, you are blazing down the water slide's track at 50 mph at a 60 degree angle! Not up for Verruckt? No worries, Schlitterbahn has a wide range of other attractions for the whole family. One of the most unique parts of Schlitterbahn is their various rivers. Some cannot be called "lazy" as they actually have areas of rapids, but they are a whole lot of fun. In addition, they all loop together. So, you can start on the King Kaw, but then lead into the other rivers like the Mighty Mo, you can even go on different water slides without ever leaving your tube or the water. Their ingenious systems of tube escalators means that you can have an endless day of floating fun with your family without leaving the water to wait in long rides. I can't wait to go back with the boys and experience some more! To find out more about Verruckt or the Schlitterbahn water park, you can visit Schlitterbahn.com, or check out VisitKansasCityKS.com for full vacation planning information for the area. Would you go insane riding Verruckt? That looks amazing but I would be totally freaked out! My kids, on the other hand, would love it! Ages 14 and up can enjoy Verruckt! I wouldn't go on that for all the money in the world LOL. I like my feet on the ground. No. nonononononononono. I'd love to see OTHER people ride it, though. Oh my gosh, that looks like SO much fun! I've never been on a waterslide but have always wanted to! Next summer it's going to be on my to-do list for sure! I can't believe you have never been on a waterslide before, you have to go Trisha! If not this one, then another. no way no how, never. but someone needs to go w a gopro on that ride! You actually can't take a GoPro on with you. Someone in our group brought one, but couldn't take it on. There is no way on God's green earth that I would every volunteer to go down a ride like that. I would have nightmares just watching the kids do it! Nope. Not getting on that thing. I make it a point never to get on anything that requires a safety net. Wow that is quite a crowd but it so looks worth waiting to get in! My son and i would so be all over this ride! The wait isn't so bad after you sign up for a time. The line you see in the video is the line of people waiting to schedule a time to come back and ride it later. There is a walk up line throughout the day for those who want to take their chances waiting. That line holds people who fill in spots on rafts. I would no sooner get on that either, what a scary slide. That is horrifying. My husband would go on it, I'm sure. That looks like a spectacular waterslide! You are very brave! I totally want to go on that now! This looks amazing! I'd love to go to this. The rivers look like they would be so much fun! If it weren't for the fact I'll never put a bathing suit on again, I would absolutely 100% do that. I love thrills like that! That ride looks so scary. My kids would drag me on something like that and laugh at my reaction. We love roller coasters. I have seen so many great post about Kansas City - I think we need to plan a trip there. I hate hate hate rollor coasters, but I LOVE water slides. The fact that this one is enclosed and doesn't have all the loopty loops I'd be in this line all day! Looks like fun! Those are some beautiful pics but there's no way I could go on that. My kids on the other hand would LOVE it! I rode my first water slide this year. I almost passed out from being so afraid waiting in the line. I definitely know what you felt. I have passed this plenty times on the interstate and never stopped! It looks so fun!